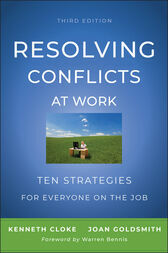 This definitive and comprehensive work provides a handy guide for managers, employees, union representatives, human resource experts, and consultants seeking to maintain stable and productive workplaces. Kenneth Cloke (Santa Monica, CA) is Director of the Center for Dispute Resolution and founding President of Mediators Beyond Borders. He is a mediator, arbitrator, attorney, coach, consultant, and trainer, specializing in communication, negotiation, and resolving complex multi-party conflicts, including community, grievance and workplace disputes, collective bargaining negotiations, organizational and school conflicts, sexual harassment and discrimination lawsuits, and public policy disputes, and in designing preventative conflict resolution systems for organizations. His coaching, consulting, facilitation, and training practice includes work with leaders of public, private and non-profit organizations on effective communications, collaborative negotiation, relationship building, conflict resolution, leadership development, strategic planning, team building, and organizational change. He is a nationally recognized speaker and author of many journal articles and books. Joan Goldsmith (Santa Monica, CA) has been an educator, organizational consultant, mediator, and trainer for forty-five years, specializing in collaborative negotiation, high performance teams, leadership development and organizational change. She was a co-founder of Cambridge College and a life member of its Board of Trustees. She has been a leader in mediation, public education and higher education as a professor, administrator, consultant, facilitator and trustee. In partnership with Ken Cloke and the Center for Dispute Resolution she has been a mediator and trainer in conflict resolution. She is the author with Warren Bennis of Learning to Lead: A Workbook on Becoming a Leader.